These are supplementary notes to the podcast interview. Tuesday, April 22, 2014: Denise drives Jim to the airport a las mil (the Spanish equivalent of “o'dark thirty” for those of you familiar with military parlance; 04:00 for you sticklers). Jim flies via Miami to Managua, Nicaragua (point “B” on the map), where the teaching team sent by LendAHand Mission Teams assembles during the day, including Dr. Gladys de Chávez from Guatemala. 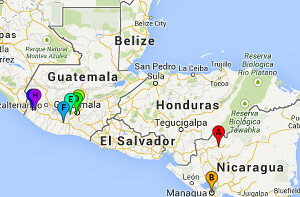 Wednesday, April 23, 2014: The team travels overland travel for five hours to Quilalí (point “A” on the interactive map). Thursday-Saturday, April 24-26, 2014 — teaching conference for about 125 attendees. Jim's subject: Hermeneutics (module 1) — how to read and preach the Bible in context. 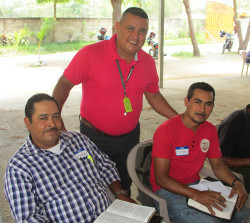 Sunday, April 27: Team returns to Managua, participates in Sunday-evening meeting in a local church. Wednesday, April 30: Rare “day off” due to a communication mix-up with the local pastors. Jim spends the day working on notes for the Guatemala conferences; Gladys starts the 20-hour bus ride back to Guatemala. Thursday, May 1: Jim flies to Guatemala City; Gladys arrives home; remaining team members return to the States. Jim spends the day with Atilio and Gladys Chávez and their adult children, Marian, German (pronounced “HERR-man”), and Tirsa. Friday-Saturday, May 2-3: The first of three weekend conferences on the Epistle of Jude, this one in the church Atilio pastors in Zona 6 of Guatemala City. (See point “C” on the map.) Gladys and German and Tirsa Chávez take turns translating for Jim. More than forty in attendance. Sunday, May 4: Jim preaches at Atilio Chávez's church in Zona 6 of Guatemala City (also point “C”). Around dinner time he is dropped off at his host-family home in Antigua (point “E”). Monday-Thursday, May 5-8: One-on-one Spanish tutoring in the beautiful garden of the Antigüeña Spanish Academy in Antigua. Four hours of “class” time each morning is followed up with six to eight hours of study, memorization, and homework each afternoon and evening. 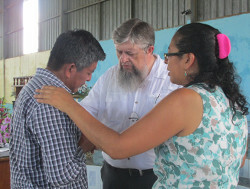 Friday-Saturday, May 9-10: The second weekend conference on Jude, this time in the southcentral town of Siquinala (point “F”) at the church pastored by Walter Almaras. German Chávez translates. 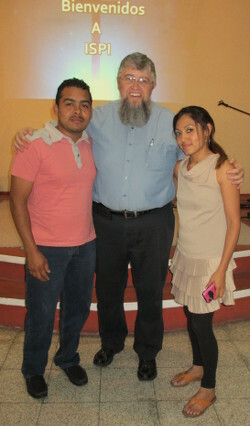 Sunday, May 11: Jim preaches at the church pastored by Jorge and Emilsa Pérez in Zona 12 of Guatemala City (point “D”), with Tirsa Chávez translating. After a Mother's Day lunch, Jorge delivers Jim back to the Chávez home, and Atilio and German take Jim back to his host family in Antigua. Monday-Friday, May 12-16: More school, more Spanish, more conversation, more interaction, more homework! And Wednesday is the afternoon that Jim is blindsided into teaching a Bible study almost entirely in Spanish. Monday-Thursday, May 19-22: More Antigúeña Spanish Academy, with the last day spent laying out a course of study for the rest of this year. Thursday, May 22: Pastor Jorge Pérez and Jim leave Antigua late in the afternoon and travel the five hours to Coatepeque (point “H” on the map). Friday-Saturday, May 23-24: The final weekend conference on the Epistle of Jude, held in the church building at Bethania, the church pastored by Pastor Edwin Reyes (point “G” on the map). 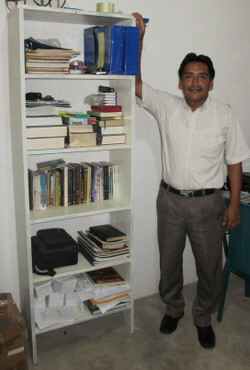 Breakfast and dinner each day are taken at the home of Pastors Fermin and Lilian Chávez (last heard from in The Coatepeque Kitchen Interview). Jorge and Jim spend an enjoyable late afternoon and evening with the Chávezes, including their children Rut and Josué. Jim interviews Fermin and Lilian (again) and Jorge (for the first time) for upcoming podcasts. Sunday, May 25: Jim has the privilege of preaching at the Coatepeque church. This is the first time the sanctuary has been used since second-floor-construction preparation began in February. Jorge is anxious to return home, so we have lunch on the road (Burger King, anyone?) as we make the five-hour trek back to Guatemala City. Monday, May 26: Most of the day can be characterized as “home alone.” With Marian, German, and Tirsa off at their respective college classes and Atilio and Gladys off to a weekly pastors' zone gathering, Jim has a chance to wait on the Lord — and to start packing! Dinner at home is with five other pastors (an informal post-meeting get-together), which includs Jorge and Emilsa Pérez, Jairu and Migdonia (pictured above), and Pastor Willhem. Tuesday, May 27: A “packed” morning — Jim finishes packing, settles up with Atilio on conference expenses (mainly hotel lodging), leaves behind a gift of about $740 (mostly for the ongoing Coatepeque construction project), and manages to squeeze in an interview with Atilio and Gladys (a follow-up to last year's Lake Atitlán Interview), all before leaving for the airport. 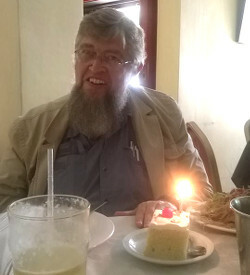 We stop at a Chinese restaurant near the airport for lunch, during which Atilio, Gladys, and Tirsa have the wait staff present Jim with a piece of tres leches cake topped with a birthday candle (one day early). Jim's flights home are blessedly uneventful, landing him in Norfolk just minutes before midnight. Wednesday, May 28: Finally arrive home in the wee hours, sleep in until about 08:30, unpack, start the laundry, and spend a very quiet birthday with Denise. Podcast theme music: “Steam Train” from the John Williams album Dusty Porch, under license from Magnatune.com. 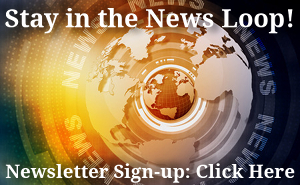 Copyright © 2010–2015 Finest of the Wheat Teaching Fellowship, Inc.